Pumpkin Soup with Sherry and a bit of Tomato, Thyme for Cooking easy soup. 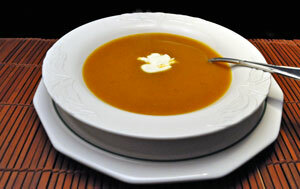 This is quickly made with canned pumpkin and can easily be doubled or tripled. It keeps well in the fridge or can be frozen for later. The sherry and tomato paste add depth of flavor. In medium sauce pan sauté leek in butter until transparent. Add pumpkin, stock, sherry, tomato paste, marjoram, ginger and nutmeg. Heat to boiling, reduce heat and simmer 15 minutes. Add more stock, sherry or water if you want a thinner soup.